More Record success for "tying a child to something"
Enthusiasts for tying children to things were today celebrating another milestone in passive record breaking by arbitrarily young people following the announcement of the country’s youngest “skydiver”. 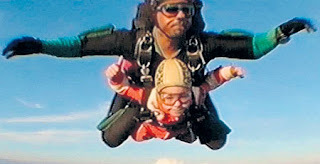 Tom Hayes, 7, became Britain’s youngest Skydiver when his parents allowed him to be tied to a stranger and flung out of a plane. Tom’s sister Lucy was unable to take the record from her brother since she is eight. She had to console herself with being Britain’s youngest female “skydiver”.